If the government does not act to change the income tax rules now, many will see their taxes go up when filing next winter… and not by a little but by a lot as $2,000 is hardly small change, The reason lies mainly in the Alternative Minimum Tax (AMT), originally dubbed the “rich man’s tax”. This is a lesser known tax and you won’t be alone if you have never heard of it before. The original intention when enacted in 1969 was good – to close tax loopholes so that the rich would not be able to benefit from large deductions and pay their fair share. You’ll say: what do I care about this tax? I’m not rich. The problem is that over the years this tax has started to hit more and more people and in the past 10 years it has been on the verge to be unleashed on the middle class. 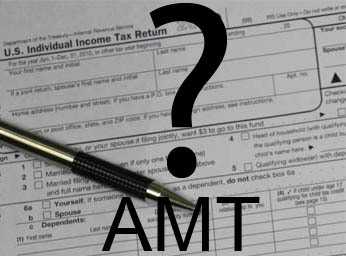 The government has been postponing this by “patching” the AMT exemption rules with the most recent one in quite dramatic fashion in December of 2010. If Washington does not act or waits until the last moment, a family of 4 making $80,000 a year in 2012 could see their refund shrink or will have to pay about $2,000 more when filing their taxes! If that same family makes $130,000, their taxes could go up by $5,000 or even more. It is obvious that the burden will be carried by the middle class and this is not great news in the current state of the economy. Is it time to panic? Not necessarily. In the past the government has prevented such sharp tax hikes. Now in a recovering economy when people are more likely to get some form of financial stimulus, a tax increase seems counter intuitive. On the other had our nation faces a historic amount of debt and Washington is and will be trying to pass a more balanced budget. One of the ways to achieve this is by raising taxes. One thing is for sure – this topic needs to be in the center of political discussion now instead of on December 15th. What can we do about it if the tax indeed goes up? As with most tax strategies, the more time we have -the better. The sooner this issue is addressed, the better we can prepare and minimize the negative effects of AMT. Amongst them are deferring or prepayment of property and state taxes, establishing an accountable plan if you have employee expenses, capitalizing of property taxes to name a few. This is all we can do on our end. The rest is left to the political leaders. We are in for an interesting and eventful rest of the year pertaining to the tax rules.